These days, sending money to a loved one, a friend, or to a merchant, is very easy and convenient. You no longer need to go to the bank for over-the-counter transactions. With just a few taps on your smartphone, your money will be sent immediately to your recipient. If you’re not yet using online and mobile banking facilities nowadays, you’re missing a lot on so many of its features. I understand and I respect you if you are not yet ready to use these new innovations. 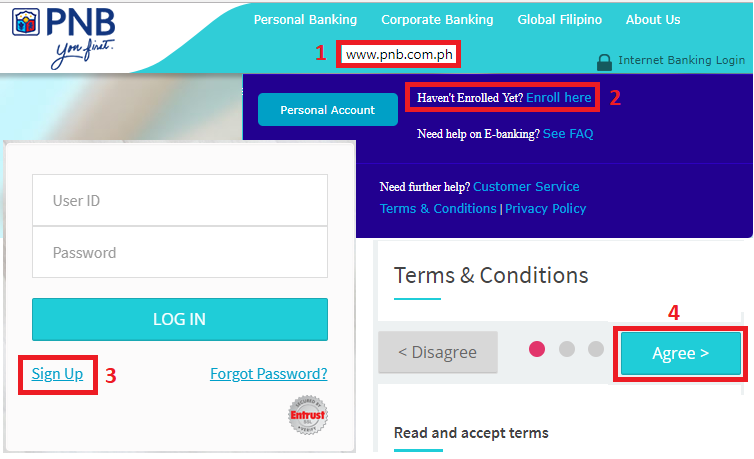 For PNB account holders who are ready to take advantage of online banking, I’ll share with you the process and steps on how you can send money easily and conveniently to other accounts online, anytime, and anywhere you are with PNB Online Banking. Read and Agree on the Terms and Conditions. Fill out the PNB Online Banking Enrollment Form. Follow the next instructions to complete your enrollment and activation. Once your new PNB Online Account is activated, you may start enrolling other PNB accounts for easy funds transfer transactions. Choose your source and target accounts. The target accounts can either be your own account or a third-party account enrolled to your online banking. To enroll target accounts, go to Enroll Additional 3rd Party Account. You will receive an activation code through email, then use the code to activate the enrollment. Go to Enrollment, and then go to Additional Third Party Accounts Enrolled Detail. Double click on the account’s reference number, and then submit the activation code online. The account will immediately be activated upon doing so. Indicate the transfer schedule, transfer amount, and alerts. For the schedule, the funds can be transferred immediately, in a set future date or on a repeated basis. The recurring schedule can be any of the following: monthly, semi-annually, quarterly, or annually. 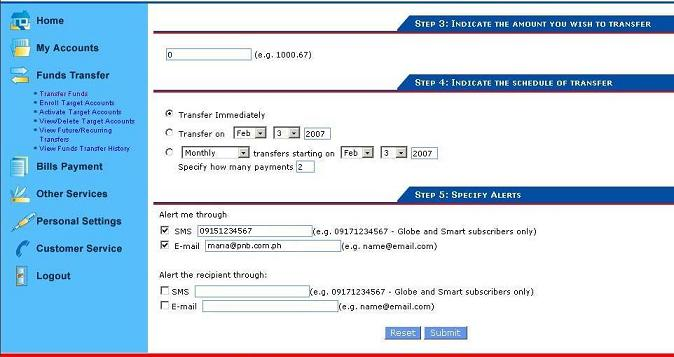 You can choose to receive your alerts through email, SMS or both. There are no limits with fund transfer amounts; as long as it can be covered by your account balance, then you’re good. Always follow the on-screen instructions as the online platform may change anytime. You can only send or transfer money to another PNB account. Transferring money to another bank account is not yet available with PNB Online Banking. The money transfer will be received immediately by the recipient once the transaction has been successfully completed and as long as it was send within the cutoff which is 9pm. Beyond that, money transfer will be shown on your transactions the next business day. Fund transfers will only be done between two accounts that have the same currency. 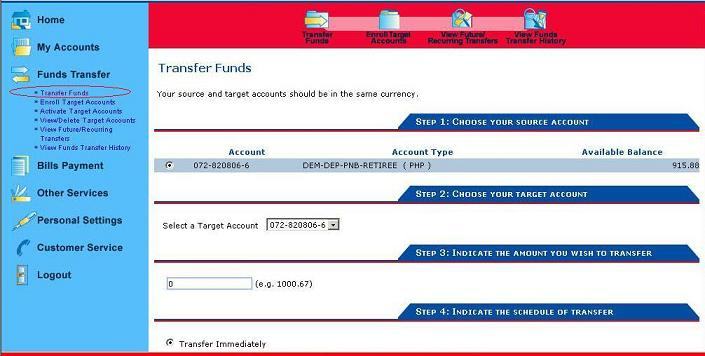 You can’t perform fund transfers from peso to dollar accounts and vice versa. Entering your passwords incorrectly for three times may result to your account being blocked. Is it Safe to Send and Transfer Money through PNB Online Banking? Yes. PNB performs security measures such as 128-bit SSL encryption (highest level of encryption), firewalls and the use of Verisign. You also may need to reenter your password whenever there are prolonged idle times i.e. session timeouts. For added security, make sure you don’t share your login information to anyone. Keep it in a safe place and make sure to log out immediately after your online banking transaction. If something doesn’t look right or if you think you’re a victim of fraud, contact PNB Hotline immediately at (632) 573-8888, email customercare@pnb.com.ph, or visit the nearest PNB branch.